Nice property situated on a farming estate dating back to the 16th century near the medieval town of Cortona. 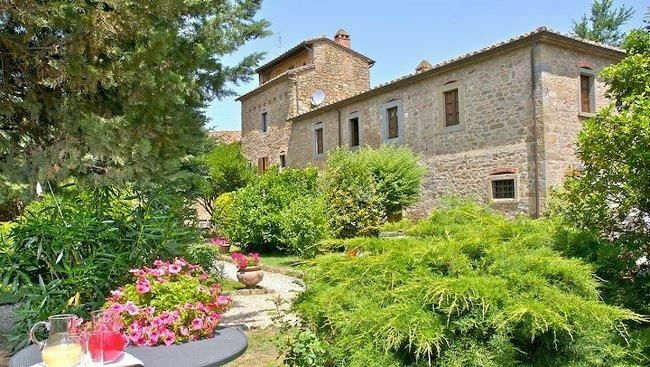 This property comprises several stone buildings which have been skillfully restored and turned into 10 comfortable apartments, all of which tastefully furnished in a Tuscan style. The property offers a large shared garden, a personal furnished outdoor area for each of the apartments and a nice swimming-pool enjoying beautiful views over the ancient town of Cortona. Distances: Cortona with all kinds of shops 3 km away, Camucia (railway station) 3 km, Arezzo 30 km. Lake Trasimaneno is approx. 15 km away. At guests’ disposal: large outdoor areas, swimming-pool (16 x 8 m – maximum depth 2,2 m – open from 15/05 to 30/09), barbecue. Shared laundry available. Parking within the grounds. Some of the apartments are provided with mosquito nets. Extra services: Baby bed available on request at € 26,- / per week (to be paid locally). Extra bed available on request at € 52,- / per week (payment on site). Maid service by arrangement (€ 15,- / per hour payable on the spot). Cook service available on request. Wi-fi internet connection available (payment on the spot). Small pets are allowed by paying an extra charge of € 50,- / per week. A few apartments are provided with air-conditioning which is compulsory in the period from 28/06 to 30/08 (€ 60,- / per week to be paid locally). Check-in on Saturdays between 16.00 and 19.00. Ground floor: dining area with kitchen corner (oven), double bedroom, bathroom with shower.